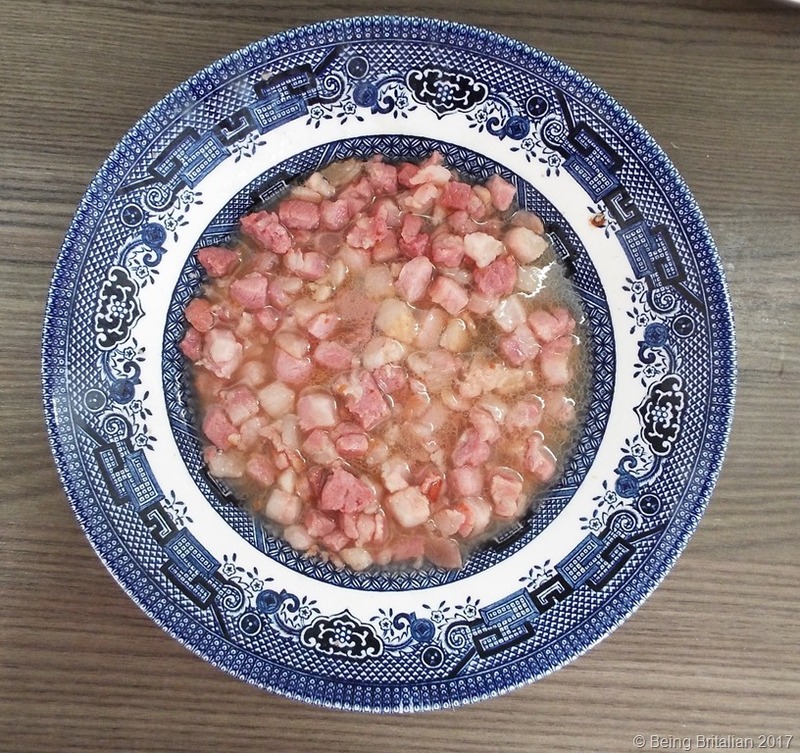 Pallotte cace e ove sometimes called pallotte cacio e uova are an Abruzzese traditional food coming from leaner times, now referred to as, cucina povera. I’ve eaten these many times at many different places but until today I never tried to make my own. So with the rain making the day a dull one what can be better than something warm and comforting. 4 eggs. 100g parmesan cheese. 250g pecorino cheese. 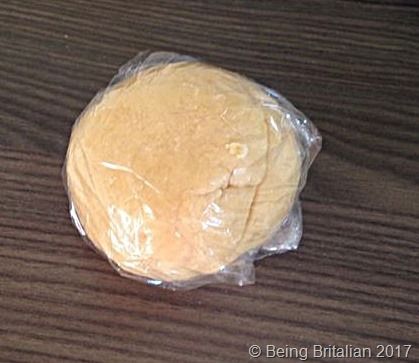 * 2 slices of bread. 1 teaspoon of garlic powder, salt, pepper and a small bunch of parsley. The bread should be at least 2 or 3 days old, soak it in a little water for a few seconds and squeeze it dry and crumble it into the eggs, add the cheese, chopped parsley, garlic powder (or a fresh clove finely chopped), season with a little salt and pepper and mix together. It’s best to do this with your hands, if the mixture feels too crumbly add some more bread. Once well mixed portion out into 16 evenly sized balls. You can then choose to shallow fry or deep fry, I chose to deep fry in batches of 4 until golden coloured, this takes about 5 minutes each batch. You don’t need to cook them all the way through as they will be cooked again in the tomato sauce. Take care as they will stick so you need to keep them moving in the oil. I chose soya oil as this has virtually no flavour. These cheese and egg balls are very filling so I’d recommend three per person as a starter, so you can freeze any extra to use at a later date. Now it’s time to think about the sauce, I make my own passata and you’ll find the method here: Sauce for the Year If you’re not inclined to make your own tomato sauce then a good quality shop bought one will suffice. For our lunch today I put 600 ml of sauce into a saucepan, added 2 whole garlic cloves, salt, pepper and a sprinkle of dried oregano and finally a teaspoon of English mustard. I brought the sauce to the boil then turned down the heat to let it simmer for 10 minutes: You’ll see it start to thicken. Add to this the pallotte cace e ove and let them cook in the sauce for a further 10 ti 15 minutes until the balls are cooked in the middle. Serve and enjoy. * Any sheep or hard cheese will do, don’t stress about not being able to find an Abruzzese pecorino, after all this is cucina povera so any leftover cheese will suffice even a mature cheddar. Remember it’s all about the flavour, maybe I’ll try making them with a blue cheese next. Twelve weeks have slipped by since I last added to this blog and I apologise for neglecting it. I’d like to say it’s because I’ve been too busy with work, however that’d only be a half truth as I’ve also been busy eating out and enjoying the summer. It’s eating out during the tourist season that I’m writing about today. Out of season the restaurants are very happy for the local population to patronise their establishments and are often more attentive. However as soon as the tourists arrive the attitude as well as the food changes. I was having a conversation with a friend about this a month or so back after we had visited a restaurant we’d visited many times before and had a terrible experience. The season was winding down and when we entered the almost empty dining room we noticed that parts of the bar were already being packed away, meaning the small eatery will probably close over the autumn and winter months. Fair enough, if there’s not the custom to make it worthwhile opening then it makes sense, but surely if they remain open to diners they can pack up later. The waitress (eventually) strolled over to take our order and everything we asked for off their menu was no longer available. Sorry no pizza, sorry no fries, sorry no vongole, sorry no white wine, sorry red wine either only rosé. We all decided that as there was nothing available that we wanted we’d leave. The final insult after many weeks of eating there was to hear the waitress moan to the owner about us being miserable English tourists. Suffice to say, despite your usually friendly staff and great food, we’ll not be back again. One thing we as stranieri, ex-pats, immigrants, or however we label ourselves have noticed is that when the area is full of tourists the food quality in some not all establishments drops from excellent to average and portion sizes shrink faster than a slimmer at Weightwatchers. Service becomes rushed and the waiters that out of season are pleased to see you become less attentive; I put that down to increased trade, but regular patrons and locals do seem to get a rum deal when the tourists are in town. I’m sure this isn’t indicative of just our area, I’m sure it must go on all over the world where bars and restaurants cater to tourists – it’s just a shame that it can make you reconsider where you’ll be spending your euro the following summer. I’ve only once before attempted to make pasta and it tasted so diabolical that the expensive pasta machine languished in a cupboard for years before being consigned to the bin. So after trying a friend’s home made pasta this week I thought I’d give it another go. But of course not a simple spaghetti for me, no I want to make a ravioli. So I looked through the freezer and found some roasted butternut squash from last autumn’s harvest and in the kitchen cupboard was some walnuts. So I set out making my pasta, which is basically 1 medium sized egg to 100g of 00 flour. I mixed and kneaded the pasta for a few minutes until it formed a nice ball and wrapped in cling film it was popped it into the fridge to rest. 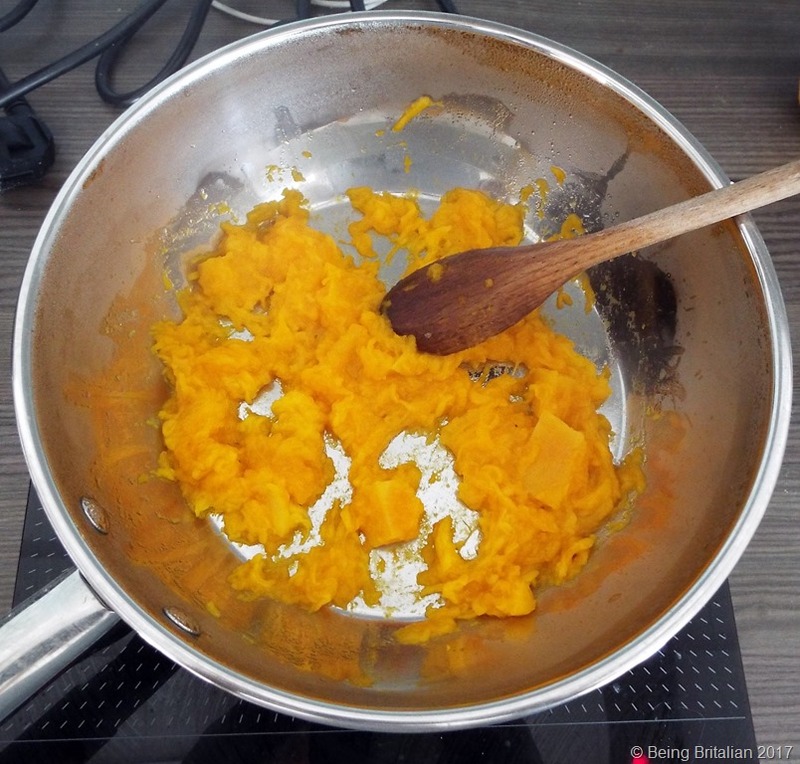 Next I chopped the walnuts and added them to the butternut which was warming in a saucepan, to this I added some nutmeg and stirred it all together making a bright ball of orange filling. This was put aside to cool. I retrieved the chilled pasta from the fridge and set about rolling it out thinly, which is no mean feat on a hot Italian afternoon. 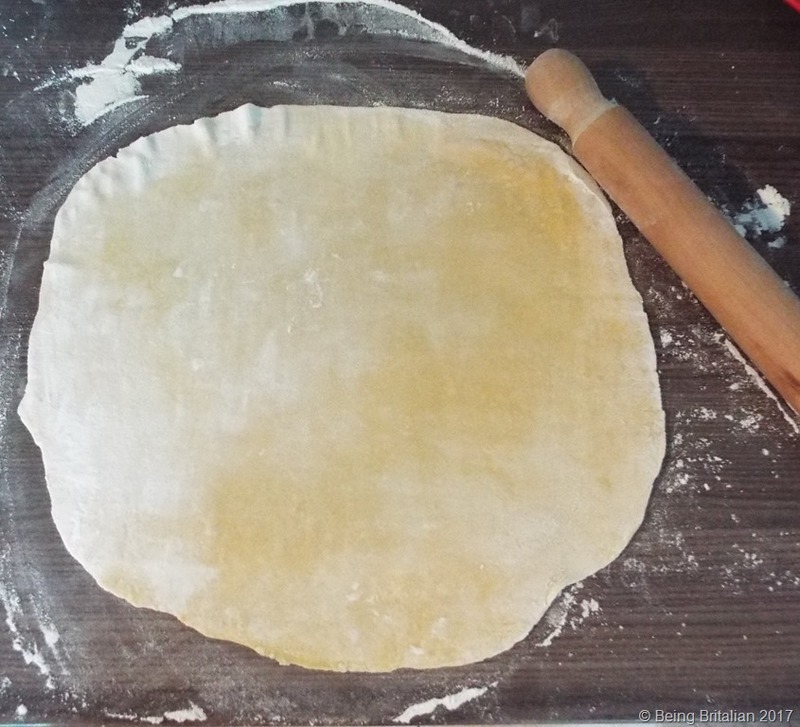 I cut my pasta into strips and then using a new ravioli cutter I started to assemble the promised pouches of pleasure, however the ravioli cutter broke on the first use and I had to start again with a roller cutter. 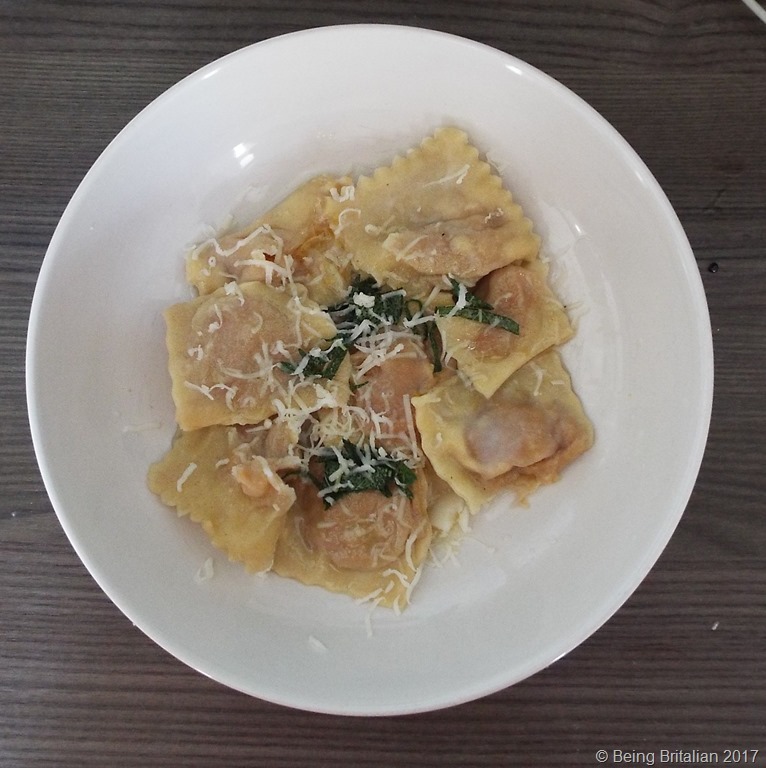 Once I’d made my first ever batch of ravioli, they were popped into the fridge to relax a while and I set a pan of water on to boil and washed fresh sage from the garden. With water on a rolling boil they were dropped in with affection as sage butter bubbled on the hob. minutes later they we scooped out and plated up. 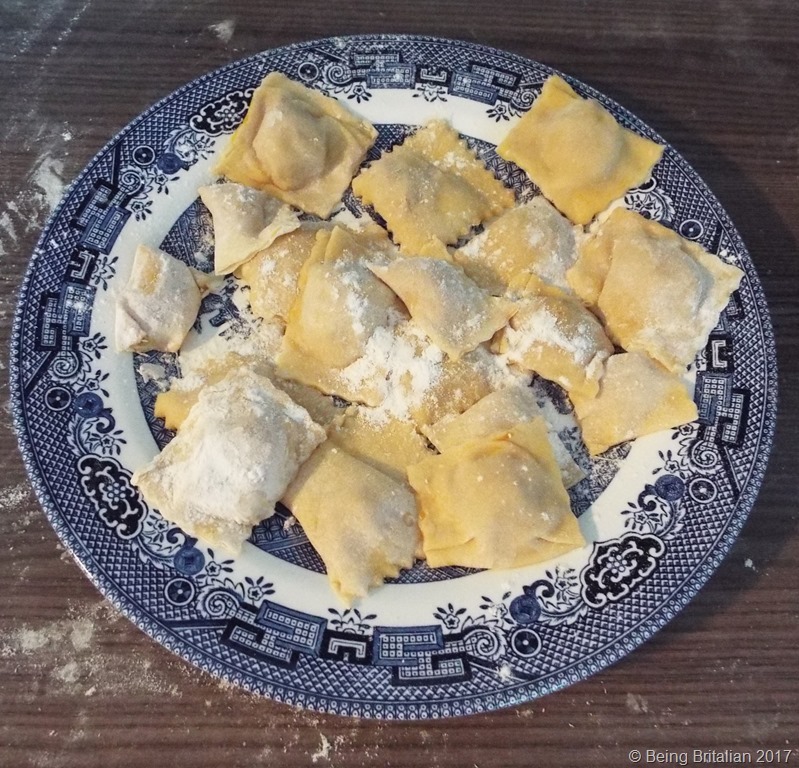 This may not be the most uniform plate of ravioli, or the prettiest, but served with a few shavings of provolone piccante they were devoured with gusto. I don’t think I’m a culinary threat to the local community, but I’m proud I gave making pasta another go. I was thinking about polenta the other day, it’s something I hated until I had it made by an Italian. My first moment of having a good dish was during a Christmas lunch at a local hotel in Fara San Martino. It tasted comforting and rustic, perfect for a chilly December day. I’ve since had it many times in restaurants, but rarely cook it at home. I did once try making it with porcini mushrooms, using the water they’d been rehydrated in. It looked like brown sludge and was consigned to the bin. 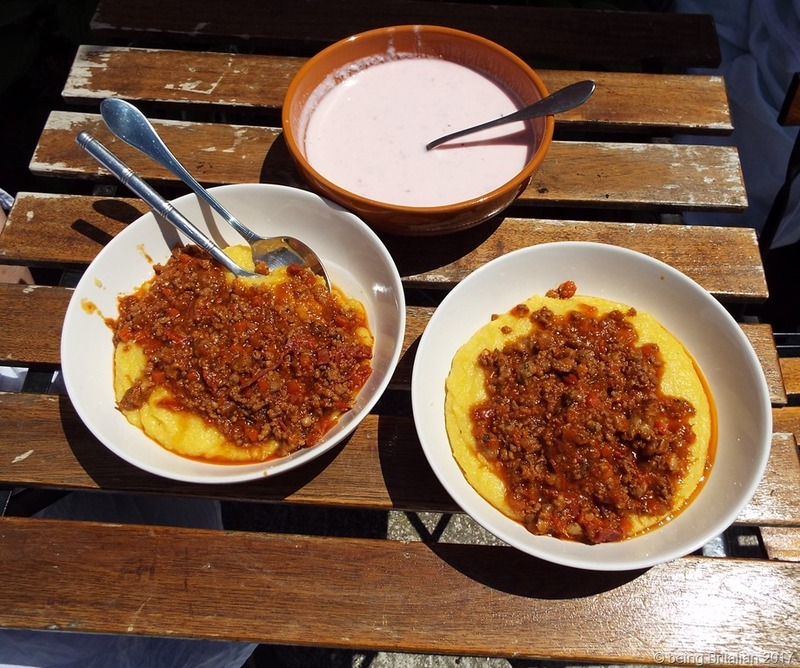 In the north of Italy polenta is served with many things but the most famous dish is polenta and sausages, served on vast wooden boards, where the diners all share the meal. I was thinking about having a go at making this when I remembered a friend of mine from Calabria loves sausages. Like all Calabrese they have to be hot spicy ones. So the cogs within my mind began to turn, synapses and neurotransmitters did whatever they’re supposed to do and an idea formed. What if I made a fusion of northern and southern Italian food? First I would need something to serve with the polenta so I started to devise a sauce taking in traits from the north. I wanted a homage to Bologna, so a typical Bolognese made like they do up north with good beef mince would be the base, and just like a true Bolognese there’d be no tinned tomatoes or passata, and it has be finished properly with a dash of cream. Now I needed the Calabrese element, so in came the sausages and some sweet fresh Datterini tomatoes and for the heat, chilli and some spicy salami. So with my idea fully formed I needed to find a victim friend to test it upon, so I called Susie who writes the Abruzzo Dreaming blog and invited her to lunch. 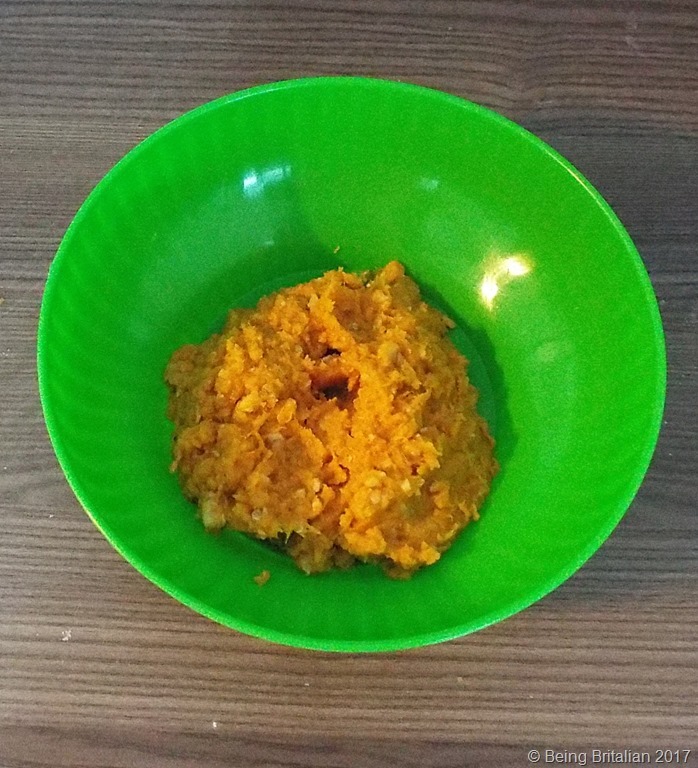 1 carrot, 1 medium onion and a stick of celery to make the soffritto (I used 200g of frozen pre-packed soffritto from the local supermarket). 1 large red chilli. 12 datterini tomatoes cut into quarters (cherry will do if you can’t get these). 200 ml beef stock (again out of my freezer). 3 garlic cloves. 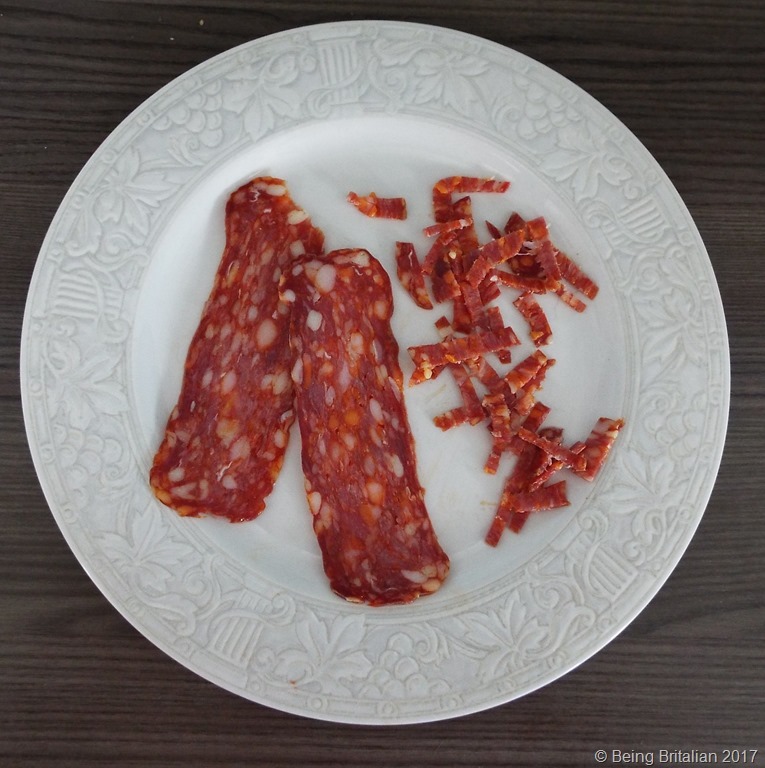 100g beef mince 100g pork sausage meat 3 slices salami picante (Ventricina is good and is becoming popular in the UK). 2 tablespoons of cream. Couple of sprigs of fresh thyme and salt and pepper to season. To start add a little olive oil (not extra virgin) to a pan and add a knob of unsalted butter. Add the garlic cloves whole but slightly crushed as we just want their aroma. 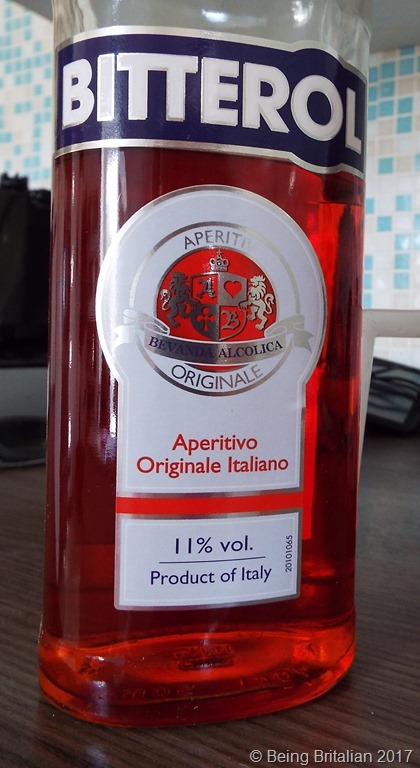 Fry the soffritto, tomatoes and chilli and cook until the mixture is soft, then add a splash of Italian bitters, like aperol or bitterol, if you can’t get this, use Campari or a strong red wine. Let the alcohol diffuse then put the mixture to one side. 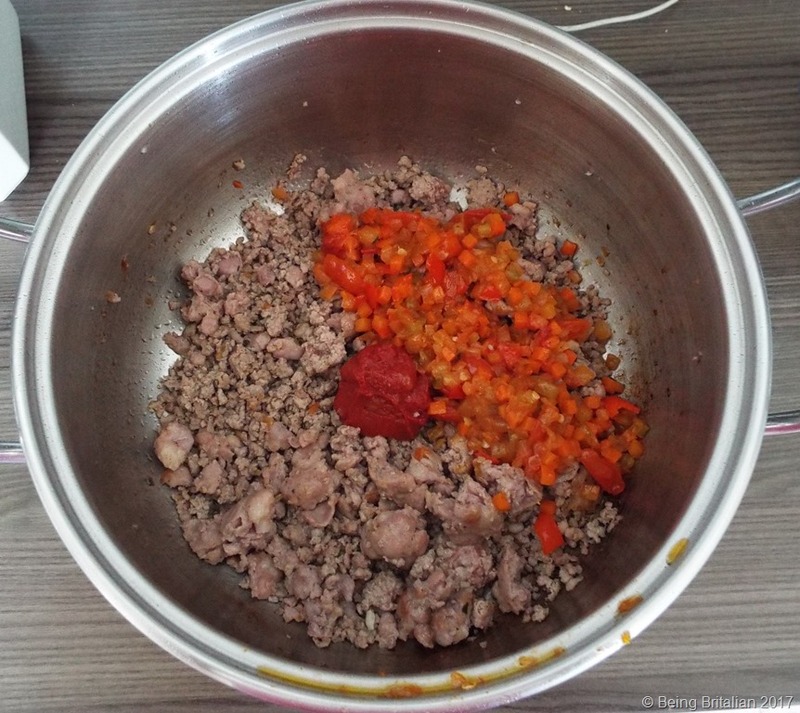 To the still hot pan add the sausage meat, mince and spicy salami cut into thin strips and fry without any extra oil, keep making sure you get those caramelised bits from the bottom of the pan incorporated into the mixture. 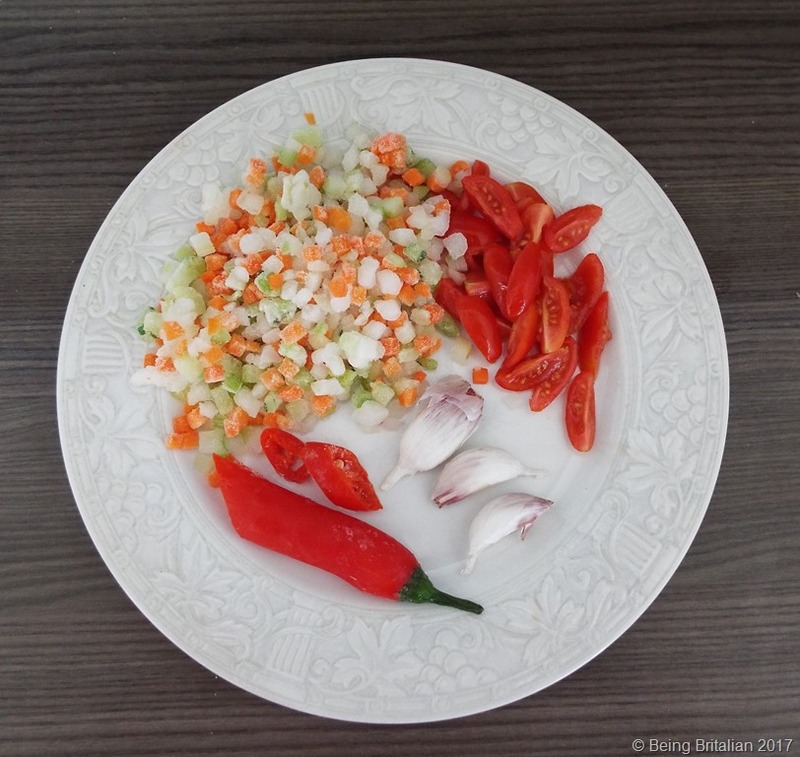 Season with salt and pepper and then remove the garlic cloves from the cooled soffritto mix, add to this a tablespoon of tomato puree and add to the cooked meat. Stir well and then add the beef stock and bring to the boil. 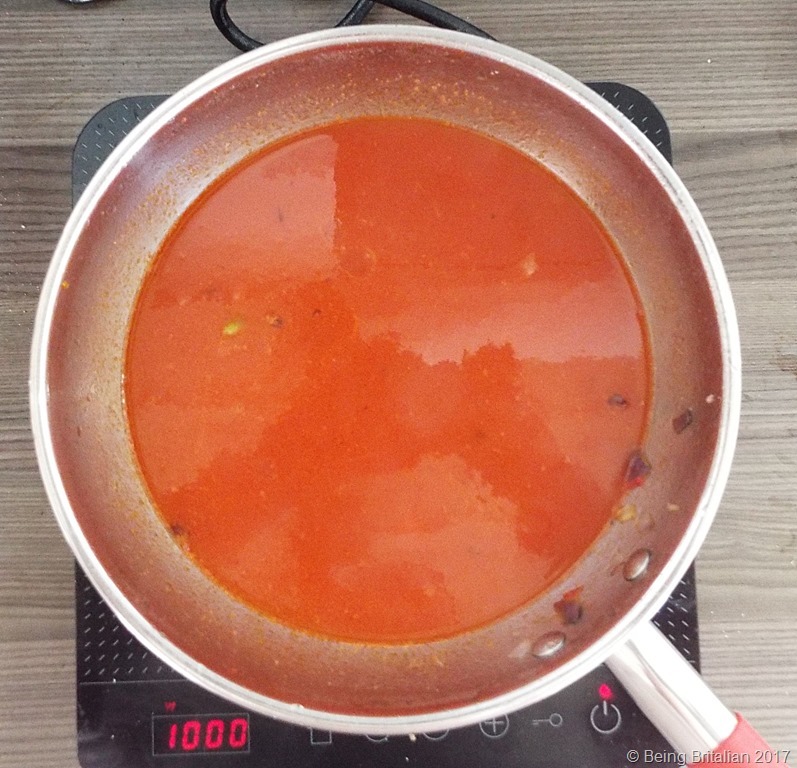 Once boiling turn down the heat and let it simmer for 35 minutes as the liquid reduces. During the last five minutes finish with the thyme, which is a nod towards the herby northern cuisine and stir through the cream. 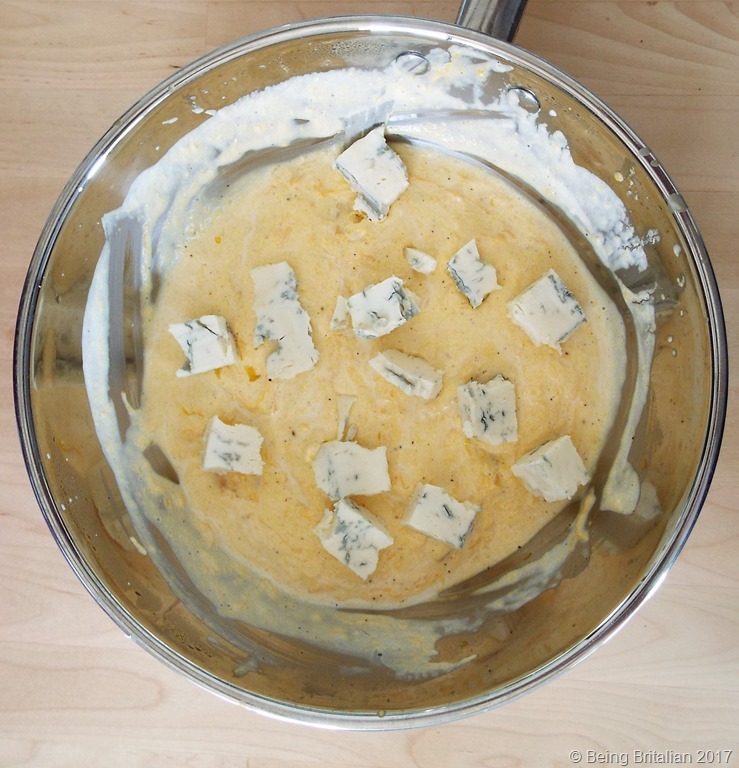 Make polenta as normal using either a vegetable or a beef stock and serve in bowls and tuck in. 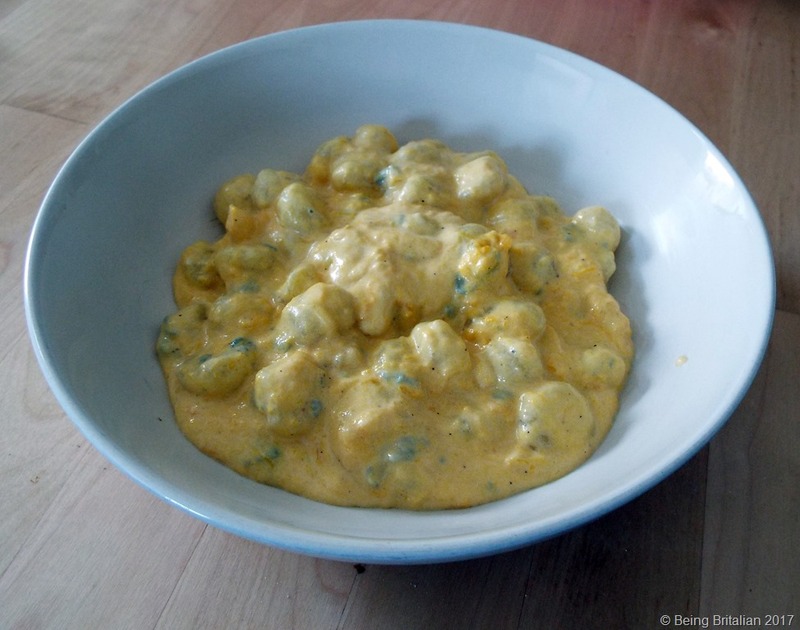 This recipe could easily feed four people so half was packed away into a plastic carton and stowed away in my trusty freezer for another day when I’m feeling like uniting the north with the south once again. It was lovely, and I made a watermelon raita just in case it was too spicy, but the balance was good, so Susie was given the raita to take home. Pasta e fagioli, literally pasta and beans, is a classic staple of Italian cuisine and everyone has their own way of making it. Mine is a conglomeration (isn’t that a fabulous word?) of several people’s recipes that I’ve had the pleasure of watching being made and tasting the end product. The dish is a great winter warmer, a hot bowl of comfort food on a cold night, or a super lunch for a spring day. 80g smoked pancetta. 200g beans dried or tinned. 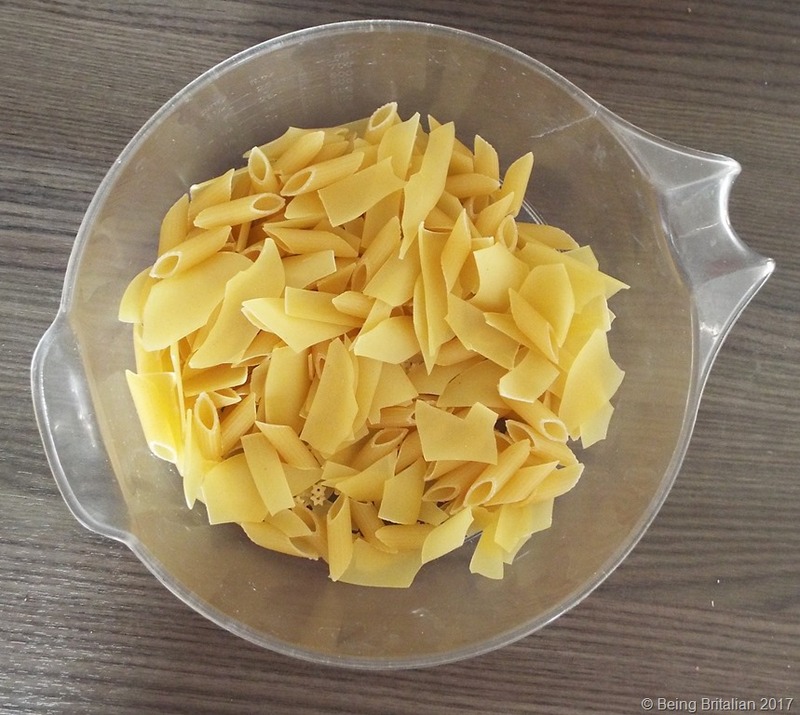 125 g pasta. 1 medium carrot. Half an onion. 2 celery sticks. 2 garlic cloves. 300 ml water. 2 tbs tomato puree. 1 tsp anchovy paste or two anchovies and for additional seasoning, salt, pepper, sprig of fresh thyme and a splosh of white wine. 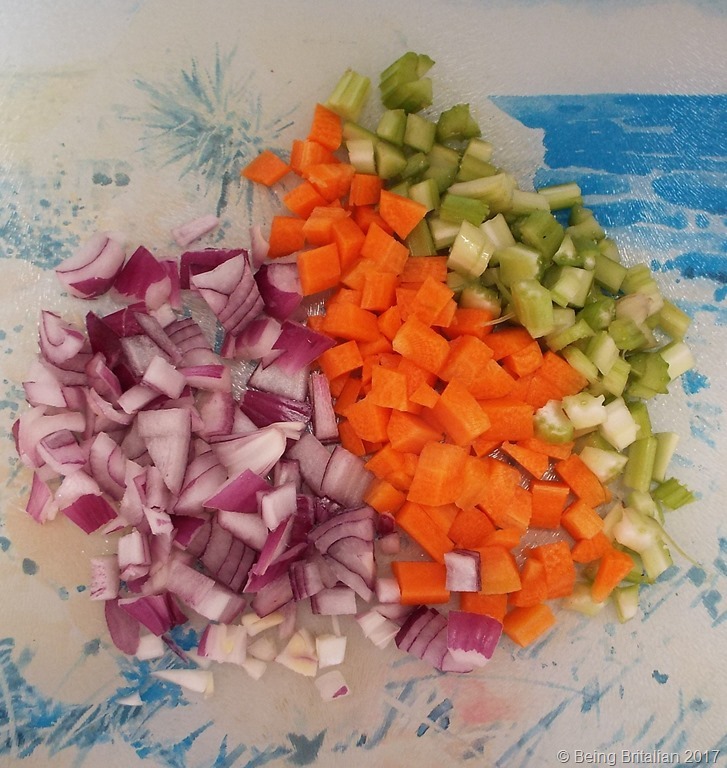 Prep the carrot, celery and onion by chopping into even-sized cubes to create the Holy Trinity of Italian cooking, an Italian sofrito which is the base of most soups and sauces here. Fry the pancetta in a dry pan until cooked then add a splosh of white wine to deglaze the pan and set aside. Add a little olive oil to the pan and fry the sofrito with the whole garlic cloves for 5 minutes. Then add the anchovy and tomato puree and cook it off before adding 300 ml of cold water. Bring to the boil and then dip the thyme into boiling water to start the release of its oils and add it to the pan with a pinch of salt and pepper and simmer for 20 minutes, with the lid on. After 20 minutes the sofrito should be soft so take the pan off the heat and remove the thyme and garlic. The liquid should still be watery, like soup not a sauce. 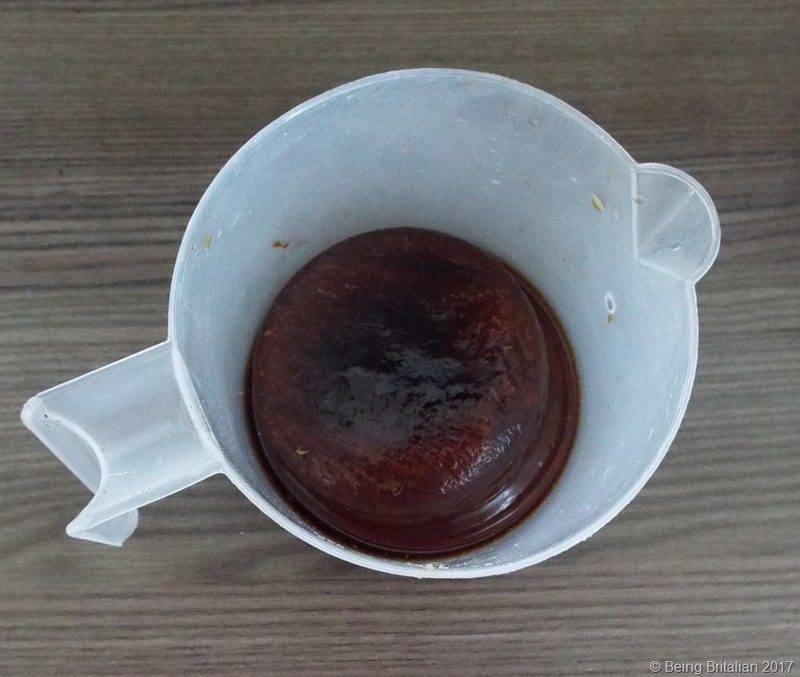 I have to admit that I think the recipe works better with real anchovies rather than the paste, however if I open a jar of them within minutes I’ll have scoffed the lot, so I always keep a tube of paste in the cupboard. 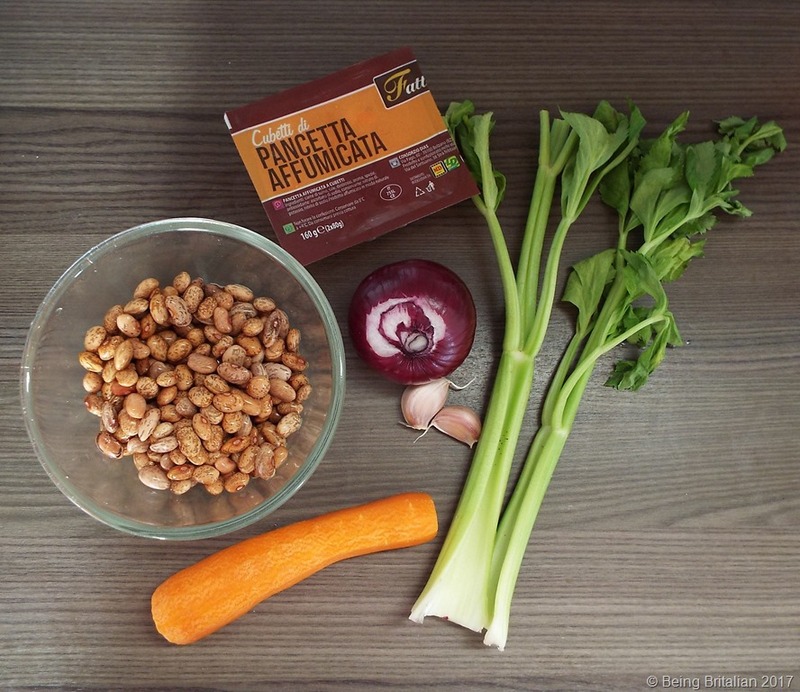 (If you have an allergy to fish just omit the anchovies from the recipe). Cook your beans and pasta as per the instructions. I use this as an excuse to use up the last bits of pasta that are knocking around the store cupboard. Today I used some stellini soup pasta, 4 cannelloni tubes broken into pieces and some penne. 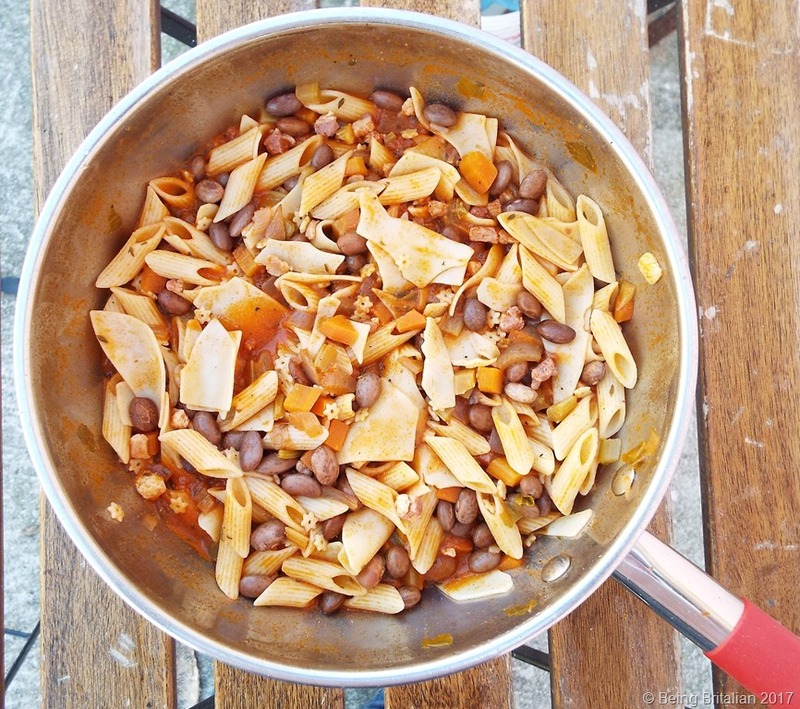 Once the beans and pasta are cooked add them to the dish and either eat straight away or leave overnight as I think it tastes better the next day, but please note if you plan to eat it the next day you’ll need to add a further 100 ml of water before reheating. Growing up in England and miles away from the coast meant that I didn’t eat much fish: in fact I was once given a fish finger as a child and recoiled in horror. Apart from tinned tuna, mussels and the occasional fish supper I didn’t eat very much fish. But now living just 18 minutes from the sea means it’s a different story. Whereas I’d probably eat fish 2 or 3 times a year now it’s 2 or 3 times a week. I’ve discovered that I like octopus and calamari, I still don’t really like prawns and people I cannot be trusted with an unopened jar of anchovies. Friday at an Italian restaurant definitely means there’ll be fish on the menu and whenever I can I like to drop into our local, aptly named, Il Bucaniere, (the Buccaneer). The reason being I can always guarantee to get frittura di pesce. Last week we dropped in for lunch which costs just €10 a head, and for this you get wine, water and 2 courses. Lunchtimes are always busy with Friday’s being the busiest. To help out the menu for the day is written up on a chalk board beneath the TV, (Italian’s and TV’s in restaurants, that’s a whole post of its own). To guarantee a table we arrive early and already the seating area at the back of the restaurant is full. We settle into our seats out at the front and the service is swift. We decide to try something we’ve not seen on the menu before and within minutes the most comforting dish of polenta with a rich fish flavoured sauce and mussels arrives. Wow, this is a taste surprise. The second course I have ordered is the frittura di pesce, deep fried calamari and small fish. It’s a fiddly dish to eat but if you go native and use your fingers then it’s easy to strip the fish from the bones, and no one is looking at you because they’re all too engrossed in their own plate of superbly cooked fish. I save a few of the calamari tentacles until last as they’re my favourite part of the dish. Our table is cleared and as we pour the last of the wine into glasses we make appreciative noises about how good it feels to be full of Friday’s fish.